H. G. Wells’ 1895 novel introduced us to a modernist conception of a time machine, a humanmade device that renders time as place, a mode of transport that shuttles back and forth along a fourth dimension that sequences past, present, and future. Wells’ lone time traveler, a man of science from Victorian England, witnesses the earth’s final destiny: in thirty million years, the planet’s rotations will stop. A cold world of crablike creatures, giant butterflies, and lichens mingling on a blood-red beach will end facing a sun that never sets. The scene warns: a world that has no cycles—no returns—has no future. Wells’ conception of time appears as a unilinear track running through distinct periods and ecologies. The time traveler leaves a rapidly expanding British society, arrives in distant futures that betray the telos of labor, and returns home to tell his stories. He leaves again, but this time, he does not return. Perhaps he met Walter Benjamin’s angel of history and his time machine was swept away by the storm of unrelenting progress. Or quite possibly, he collided with Ursula Le Guin’s two-faced wall and now burrows somewhere between opposing ideologies of Urras and Anarres. In this short tale, I explore the notion of returns, of cycles, of recursive and differential becoming. Implicit in this exploration is an argument for expanded temporal analytics that moves us away from a single-track perspective of history and futurity. To make this argument, I ask you to travel with me to the Mekong, known by mapmakers as the longest river in Southeast Asia and by time travelers as the mother of flows. I follow humans, nonhumans, and machines in their entanglements with the monsoon rains and a flowering grass cultivated over centuries to produce rice. Here, I sketch out a biogeochemical assemblage, a coordination among companion species (for better or worse) made through so many rhythms, cycles, and intervals of time. From April to September, monsoon winds blow eastward across the Indian Ocean, bringing rain to the Mekong as they make their way from Somalia into the Bay of Bengal. Rainfall intensifies into storms and typhoons in the summer months of June and July. From October to March, winds reverse direction and blow westward from the Indonesian archipelago to the Arabian Sea. Rainfall becomes less frequent and the weather becomes dry. For centuries, the oscillation between wet and dry seasons, the presence and absence of rain, has structured a recurring tempo for multispecies ways of life. The Mekong runs for 2,700 miles and crosses six nations: it rises in the Himalayas, in a region of Tibet known for its perpetual snow. From these steep upper reaches, its waters descend, flowing southward through Yunnan in China, then between Burma, Laos, and Thailand, and then through Cambodia, before branching out into the floodplains and delta of southern Vietnam. Freshwater meets the tidal pulses of incoming saltwater as the river discharges onto the South China Sea. For centuries, rain has structured the forms and rhythms of the Mekong. 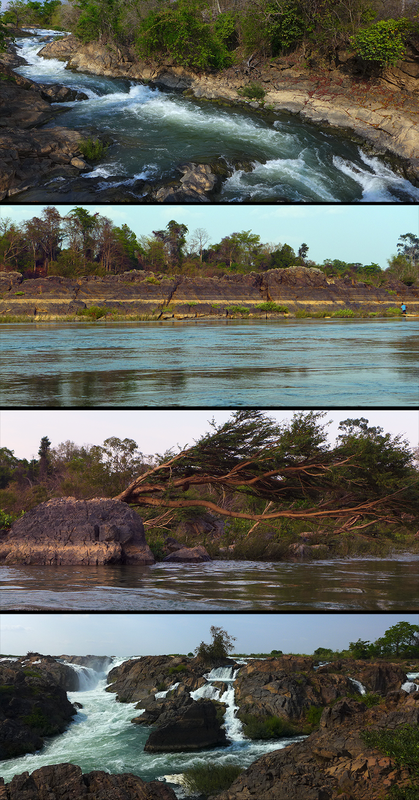 At the border of Laos and Cambodia, rocks and riverbanks bear the inscriptions of water flow, trees bend to the winds while their roots reach into the rocks, fishers sense species migrations (Gan 2017). That’s part of the story. The river has also been a site of wave after wave of human disturbance. It is shaped by empire, circuits of trade and technology, regimes of taxation and governance. In the eighteenth century, the southward migrations of the Vietnamese displaced lowland Khmer and Cham and introduced wet-rice agriculture to the delta, which has become one of the world’s leading rice exporting regions. Scholars have described the credit systems of Chinese and Indian merchants, the ruinations of colonial occupations, the Indochina wars, and the American invasions. A new wave is emerging: as of 2016, China had six megadams in the upper Mekong. Laos and Cambodia had a dozen underway. Laos will build over a hundred more in the next five years, even as one of its first in the former kingdom of Champasak already collapsed in 2018. The Mekong is hardly a static body of water, but an unruly assemblage of capacities, human and nonhuman, biotic and abiotic. 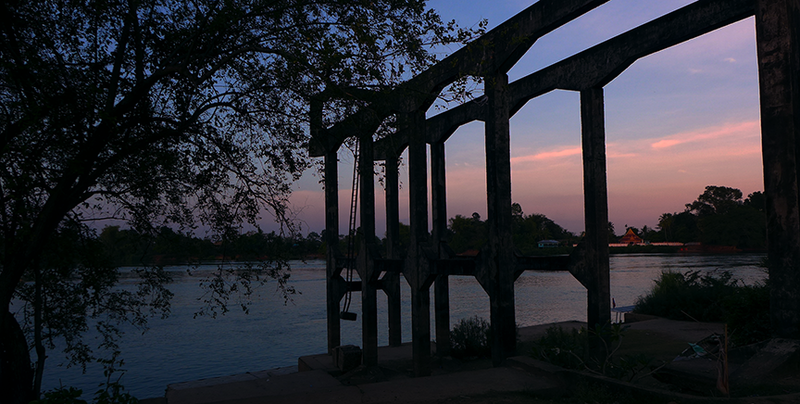 Unable to navigate their ships through the complex waterways of Si Phan Don, an inland archipelago of the Mekong, French colonists built a railway bridge to connect two of the southernmost islands, Don Det and Don Khon, in 1894. Abandoned in 1940, concrete remnants of one pier still stand along a riverbank (Gan 2017). 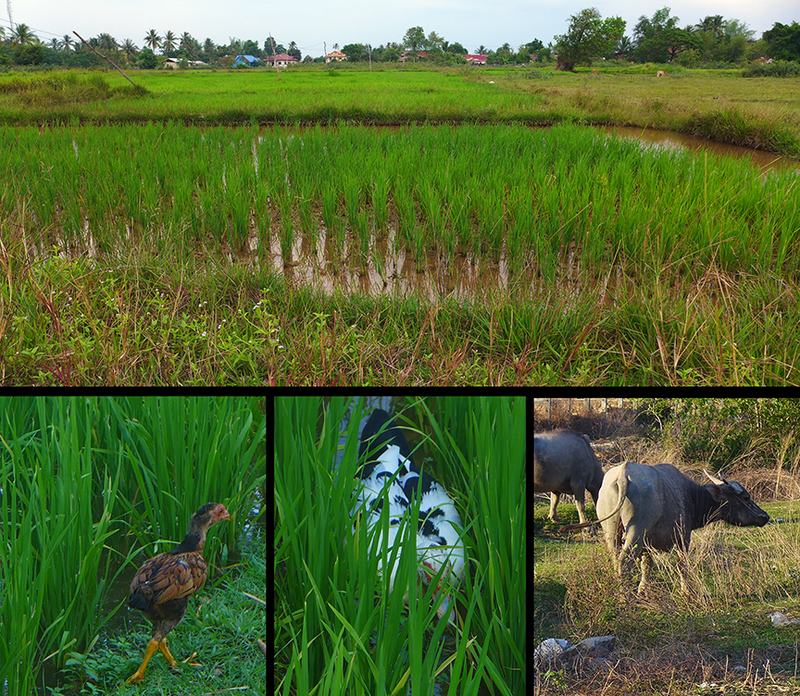 Rice is the dominant crop throughout Southeast Asia. But it is water that coordinates life along the river. High-intensity, long-duration rainfall in April signals the start of the planting season. By June, heavy rains overflow riverbanks and lead to floods. By September, the floodwater levels can exceed twenty feet. Many low-lying coastal areas may stay under water for a few months. To survive the Mekong floods, rice has to either hold its breath—or find ways to keep breathing. Over millennia, deepwater rice seems to have done just that. There are deepwater varieties that grow in the wild and others that are cultivated. Some respond to flash floods by going dormant. They stop growing and can stay under water for up to 14 days. When waters recede, they resume growth. Others, called floating rice, have evolved more capacities. Their seeds can stay dormant in the soil for up to several weeks, waiting for the right signals to germinate. As they grow, they develop internal air tubes, or snorkel-like conduits called aerenchyma, in the stem, roots, and leaves that allow a flow of oxygen to submerged parts. They also have a capacity for extreme elongation or plasticity in direct response to water levels. The stem of floating rice can grow by almost ten inches per day, and reach a height of 15 feet. Flowering coordinates with shorter day lengths; grains start to fill only as the floodwaters begin to recede. When waters recede in January, the rice is ready for harvest. Farmers use sickles to cut the ripened grain from stems lying on dry ground. Rice is a multispecies assemblage (Gan 2017). While it is said that millions of people still depend on deepwater rice, commercial farmers are increasingly turning to high-yield, quick-growing varieties that depend on chemical fertilizers and pesticides tied to Green Revolution miracle rice introduced in the 1960s. Since 1975, hydraulic development has intensified. Rather than cultivating long-stemmed deepwater varieties, Vietnam pushed to develop elaborate infrastructures for irrigation. This involved straightening, extending, and deepening canals and waterways in the delta. Farmers of An Giang, a booming rice producing province, work three harvests a year, each with yields that can reach 22 tons per hectare (much higher than the average 2 tons per hectare in the 1970s). The annual cycle of rains and floods that used to mix and flush out nutrients and contaminants, groundwater-saltwater-freshwater, became a perennial system of water management. By the 1980s, chemical fertilizers were circulating all year round through irrigation canals and leaching into waterways, causing widespread and nonstop eutrophication. These changes benefited two travelers in particular: water hyacinths and snails. Like rice, the water hyacinth is a flowering freshwater plant that has become nearly ubiquitous. Native to the Amazon, it began moving through other continents in the late 19th century. With its lavender, violet, and pink flowers, it’s a beautiful plant, a creature of empire that was often given as a gift and planted for aesthetic pleasure. Changes in the twentieth century, however, opened a new chapter in the social life of the water hyacinth. Standing water rich with nitrogen, phosphorous, and potassium—the main ingredients of farm fertilizers and modern water management—are a boon to water hyacinths. Perennial aquatics, water hyacinths coordinate through time, producing seeds that can germinate within days or lie dormant in the soil for up to twenty years. Defying popular misconceptions of plants as immobile, water hyacinths are extremely mobile: without roots that anchor them to the ground, they float along the surface of the water, easily carried by currents. They reproduce through stolons—literally, rhizomatic lines of flight that hitch onto boats and other water vessels—and they can double their spread every two weeks. Water hyacinths can form such dense mats so quickly that they simply choke everything else, preventing sunlight from reaching other plants and depleting the oxygen in water, killing fish and other aquatic fauna. Among the water hyacinth’s new companions is a freshwater snail. Endemic to Mekong riverbanks, snails thrive on water hyacinths and on partially submerged rocks—now a perennial condition because of irrigation. Snails feed on algae and repopulate every year. They are also the sole intermediate hosts of parasitic blood flukes that cause bilharzia or snail fever. Because of the snails, blood flukes can incubate and reproduce during the dry season. When rains come, they release from the snails and work their way through human skin, laying their eggs inside undoubtedly unwilling human hosts. Some eggs are passed back to the river when humans defecate or urinate in the water. Human bodies, thus, are incorporated into the parasite’s life cycle—which is now tied to the snail—which now rides the water hyacinth—which is carried by fertilizer-enriched waters that flow from neocolonial water grids that irrigate fast-growth high-yield rice engineered to feed humans like me who work in 24/7 buildings that are disconnected from the cycles of deepwater rice. As our boat moves along the river, we spot a fellow traveler: the restless water hyacinth (Gan 2017). The parasite first appeared along the Mekong in the 1950s, just as government officials in the north were becoming fascinated with new ways of harnessing the energy of floods. Dreams of modernization for a new People’s Republic of China under Mao Zedong were being yoked onto monumental machines of hydroelectric power—the modern engineering marvels of megadams. In 1986, China under Deng Xiaopeng began building a “Mekong Cascade,” a series of dams in the upper Mekong to produce electricity and wean itself off coal and oil. China controls the river’s headwaters, which begin high up with the perpetual snow of Tibet. The geopolitical response from Thailand, Laos, Cambodia, and Vietnam was to form a rival commission to build their own dams. Dams have proliferated, with multiple cascading effects. Here is one. There may only be a few hundred left of the largest known freshwater fish in the world: the giant catfish. As the largest bodies in the river, these giants, which can grow up to ten feet and weigh over 600 pounds, make a difference to the order of things. Through sheer size, their bodies influence the formation of species assemblages, the bioturbation of soil, and the cycling of nutrients. They are herbivores and feed on algae. Like the snail, they feed in the dry season and fast during the wet season—a seasonality that is synchronized with algae. Highly migratory, they live out part of their lives at sea, much like the more well-studied salmon. They swim inland from the South China Sea, and travel over 600 miles or about a quarter of the length of the river, to spawn in Thailand. The monsoon floods are their signal to head upstream. The signal arrives during their fasting season, which means they need to hitch a ride on river currents in order to travel quickly and spawn while there is plenty of oxygen and food. Dams interrupt migration routes, spawning and feeding cycles, sediment flows, and flood surges. Dams silence the signals to which the giant catfish are attuned. The catfish lose sense of time and place. Meanwhile, commercial fishing along the Mekong has developed alongside commercial rice farming. As larger fish disappear, fisheries turn to smaller and smaller species. Cyprinids (which are common carps, goldfish, and minnows used as bait and aquarium fish) make up nearly half of the catch at Tonle Sap Lake in Cambodia, the heart of Mekong fisheries. This change cycles through our futures in at least two ways. First, cyprinids feed on freshwater snails. This is a classic trophic cascade: in the absence of their fish predators, it becomes easier for snails to reproduce and multiply. Snails, you might recall, are hosts of blood flukes, the parasites that infect humans, as well as dogs, cats, pigs, rodents. Second, chemicals persist for a long time and they don’t stay put. Leaching into waterways from farms, they accumulate in the bodies of small fish and climb up the food chain. 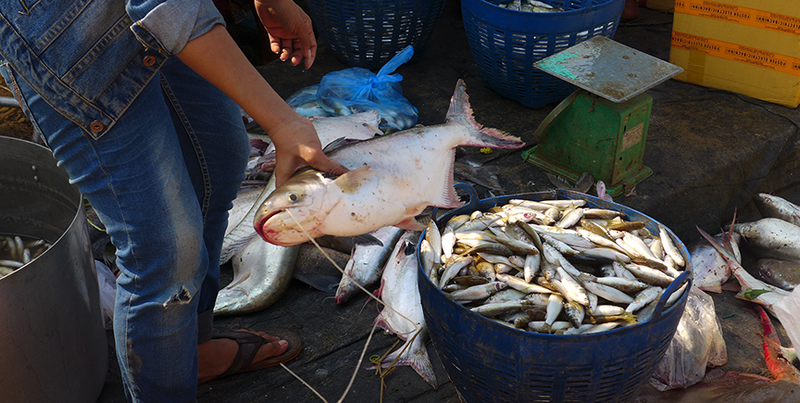 Mekong fisheries are among the largest in the world; they form a global network that now circulates long centuries of war, dispossession, and toxicity in every bite of food. A day’s catch at a local wet market in Nakasang, Laos: as large fish become scarce, fishers turn to smaller fish (Gan 2017). I close by cycling back, still in search of H. G. Wells’ lost time traveler and articulating others along the way. Rain, rice, fertilizers, water hyacinths, snails, blood flukes, giant catfish, megadams, cyprinids. These are my time travelers, an unruly assemblage of pasts, presents, and futures variously lived and haunted, rendered contemporary through elusive and ambiguous returns. I wrote the first version of this essay for the “Cultivation: Vegetal Lives, Global Systems and the Politics of Planting” conference organized by plant-friends Matthew Fuller and Sheila Sheikh at Goldsmiths, University of London in March 2016. It has benefited greatly from conversations about temporal coordinations with Anna Tsing and the warm support of Colin Hoag. All mess ups are mine. The search for the time travelers continues (Gan 2017). This post is part of our thematic series: Ecological Times.